When you first arrive in the Neonatal Intensive Care Unit (NICU), it can be a scary, overwhelming place. You'll be so busy meeting the staff, talking to the nurses and doctors, learning about the equipment and your child's condition, and just looking at your baby that the time may go by pretty quickly. However, if your baby has to stay in the NICU for weeks or months, the days of sitting and watching can begin to get longer and longer. Parents can usually visit the NICU anytime day or night. So, if you can and choose to spend most of the day in the NICU, you may find you have a lot of time on your hands once you become adjusted and settle into a daily routine. As the days go by, what should you do to pass the time while you're visiting your child in the NICU? Ask when you'll be able to hold your child and provide kangaroo care (skin-to-skin contact). Holding your baby and engaging in skin-to-skin contact is good for both your and your baby's well-being. Learn how to perform any hands-on care that you're allowed to do, then do it as often as you can. You may start out by taking your child's temperature and changing her diaper. When your baby starts eating, learn how to help. If you're going to breastfeed, ask how long it will be until you can begin trying. As the days and weeks go on and your baby gets closer to going home, you'll be able to get more involved in her care. Preemies need periods of uninterrupted sleep to grow and develop. Since a premature baby's brain is not as mature as a full-term child's, preemies are more sensitive to noise, light, and activity. They can quickly become overwhelmed by too much stimulation. That means there's definitely going to be a lot of time when you're not directly interacting with your child. You'll probably spend some of that time sitting and looking at your baby, but there are other things you can do to pass the time while your preemie is resting quietly. Talk to the nurses. Ask the nurses about your child's care and any changes in her condition. Find out if you're any closer to starting feedings or how the last feeding went. Talk about any procedures that were recently done and see if any new procedures are scheduled. Have the nurse explain anything that you don't understand, especially if you just spoke to the doctors. The nurses will keep you informed on all aspects of your child's care, progress, medications, and feeding schedule. They are your main source of information, so spend time talking to them and asking questions. Talk to the doctors. You may be able to catch the neonatologist or one of the residents on the unit, but you might have to make an appointment to see the doctor or speak to her on the phone. When you talk to the neonatal team, get an update on your child's condition. Ask about the treatment plan and find out if there have been any changes in the plan. Try to write down questions as you think of them so that when you speak to the doctor you'll be ready and you won't forget what you wanted to say. Get to know the rest of the NICU staff. When you spend weeks or months in the same place, the staff can become like a second family. They can also be a great source of information and support. So, take some time and say hello or have a conversation with the unit secretary, the PCA, the respiratory therapist, and the housekeeper. Not only is it nice to put names to faces, but you'll also know who to ask when you need something or have a question. Pump for your baby. While your child is sleeping, head over to the pumping room and express your breast milk. If your baby isn't taking formula or breast milk yet, you can label and freeze your milk for when your child is ready. You can also use this time to talk to the hospital's lactation consultant. The lactation consultant can give you tips and information about pumping, your breast milk supply, and storing breast milk for your preemie. Decorate your child's space. You can usually hang some pictures of you, your partner, and your other children on the incubator or the crib. Sometimes small stuffed animals can be placed inside plastic bags and put in the corner of the Isolette or crib. You may even be able to bring in a recording of your voice or some soft music. Just ask the staff what you're allowed to bring in before you begin decorating. Different units have different guidelines. Bring a smartphone, tablet, or laptop. Ask if you can use an electronic device in the NICU and find out if there's WiFi available. If devices are allowed, they can keep you occupied for hours. You can read, play online games, and stay in touch with family and friends. Or, you may want to do some online research into your child's condition and care to get a better understanding of what's going on and prepare for what you need when you take your child home. If you're not allowed to use a device while you're on the unit, you can still bring one. There should be a place you can go to use it, so just ask. Catch up on your reading. Bring a book. Escaping into a novel is an excellent way to pass the time in the NICU. Uplifting or inspirational quotes and books make a good choice. You may also want to read to learn more about prematurity or your child's condition. Participate in a parent support group. The social worker or clinical nurse specialist may run a support group for the parents and families of the babies in the NICU. Ask the nurses if there's one offered in your hospital. It may help to share experiences with the other parents who are in similar situations and understand what's it's like to have a child in the NICU. Leave the unit for a little while. Taking a break from the NICU and getting a change of scenery is good for you. If you're worried about leaving, take the opportunity to get away during the change of shift or procedures when you're asked to leave the room anyway. Find a place to grab a bite to eat or get some fresh air. Pack snacks and take a walk. If friends and family want to see you, meet up with them in the hospital cafeteria for lunch or dinner. Document your child's journey. Keep a camera and a journal or a baby book with you. Take pictures and write a little entry in the journal every time you visit. You can keep track of your child's weight and each milestone he reaches during his NICU stay. Celebrating the positive, happy moments is important, and you'll want to remember them. You can also write notes or letters to your child. Ask his primary nurse to write a note, too. One day when your child is older, you'll be able to show him the memories that you captured. 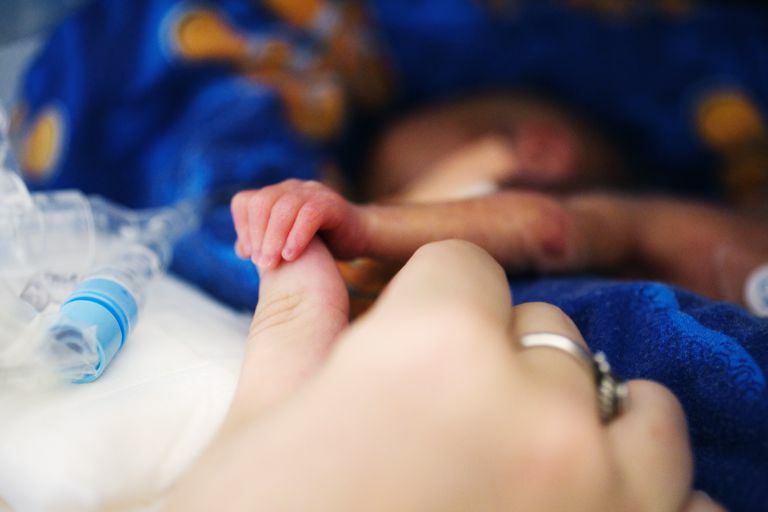 The time your child spends in NICU can be very stressful and full of ups and downs. Participating in your child's care as much as possible while keeping busy and distracted can help pass the time and get you through. The staff, family and friends, religious or spiritual representatives, and others who have been in your situation can be a great source of support and encouragement. But ultimately, how you cope and what you need is unique to you. Seek the things that you find comforting and helpful. And, most of all, don't forget to take the time to take care of yourself. Try to eat right and get some rest because your child needs you to be healthy. Calciolari G, Montirosso R. The sleep protection in the preterm infants. The Journal of Maternal-Fetal & Neonatal Medicine. 2011 Oct 1;24(sup1):12-4. Cong X, Ludington-Hoe SM, Hussain N, Cusson RM, Walsh S, Vazquez V, Briere CE, Vittner D. Parental oxytocin responses during skin-to-skin contact in pre-term infants. Early human development. 2015 Jul 31;91(7):401-6. Johnson K. Maternal-Infant Bonding: A Review of Literature. International Journal of Childbirth Education. 2013 Jul 1;28(3). Obeidat HM, Bond EA, Callister LC. The parental experience of having an infant in the newborn intensive care unit. The Journal of Perinatal Education. 2009 Jan 1;18(3):23-9. Smith VC, SteelFisher GK, Salhi C, Shen LY. Coping with the neonatal intensive care unit experience: parents' strategies and views of staff support. The Journal of perinatal & neonatal nursing. 2012 Oct 1;26(4):343-52.